Sports have a special place in Sun Youth. Since 1954, the organization has offered a number of programs to Montreal children. Some former Sun Youth athletes have gone on to professional careers, like Miami Heat NBA champion Joel Anthony and the Boston Celtic’s Kris Joseph. Recently Sun Youth hosted NBA Cares, and was part of the Purolator Tackle Hunger Program, which took place at the Montreal Alouettes game. There was a basketball clinic for kids and the NBA donated funds toward the refurbishment of Sun Youth’s basketball gym. 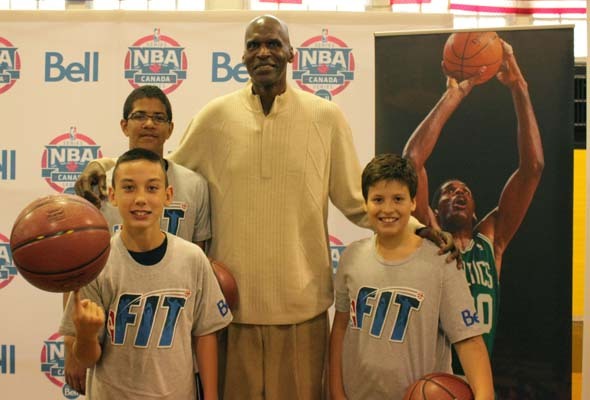 Robert Parish, a four-time champion with the Boston Celtics and Chicago Bulls and an NBA legend who holds the NBA record for most games played, was also at the event. “Basketball and sport in general, has the power to bring people together and to teach positive values such as dedication, teamwork and sportsmanship,” said NBA Canada vice-president and general manager Dan MacKenzie. NBA Cares encourages physical activity and healthy living for children and families through programs, events, and products. Two days later, the Tackle Hunger Program and Als fans collected more than 27,000 pounds of food for Sun Youth’s food bank. Since 2006, the cooperative venture has collected a total of 175,000 pounds food for those in need. This time, in exchange for their donations of food, fans were entered in a contest to have their picture taken with the Grey Cup, win an autographed Anthony Calvillo jersey, or a pair of Grey Cup tickets. Sun Youth would to thank all who took part in those events. Be the first to comment on "NBA fills tall order for charity"